Expires in 1mo . Last validated 3wk ago . Used 4 times. 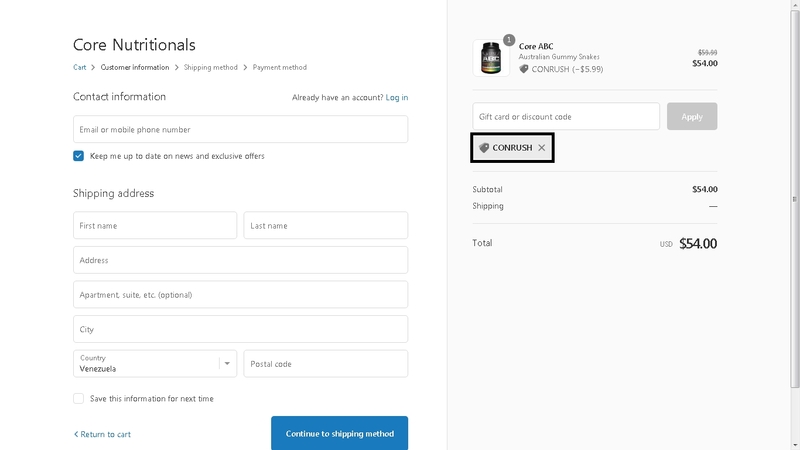 Luis Silva I have tested this deal and it works as described, just apply the promo code during the checkout process to receive the discount. There may be some exclusions that apply to this deal. Dealspotr Kierger's Shop This deal was verified and it is working as described. Select the items and enter the promo code at checkout to get this discount. Lismary Jaramillo I am validating that this deal works as described. 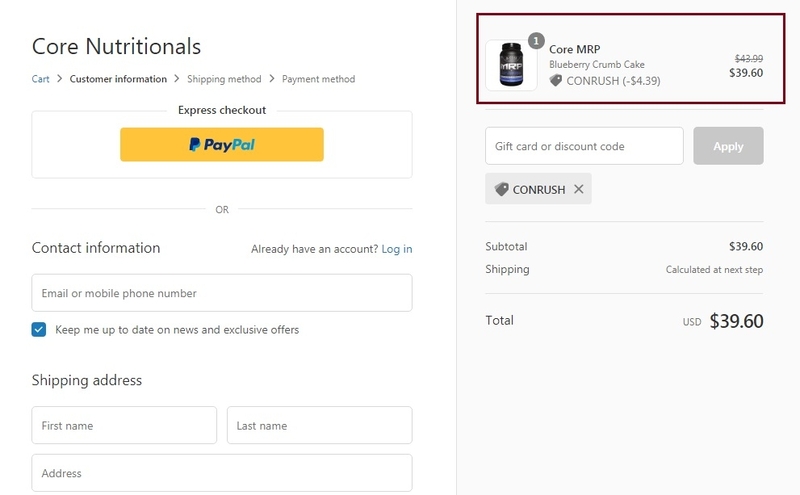 Just apply the promo code at the shopping cart and get 10% Off Your Order at Core Nutritionals (Site-Wide). Jimmy Cruz This deal was verified and it is working as described. Select the items and enter the promo code at checkout to get this discount. Carlos Alfredo Use promotional code to get a great deal: 10% off on your next purchase. 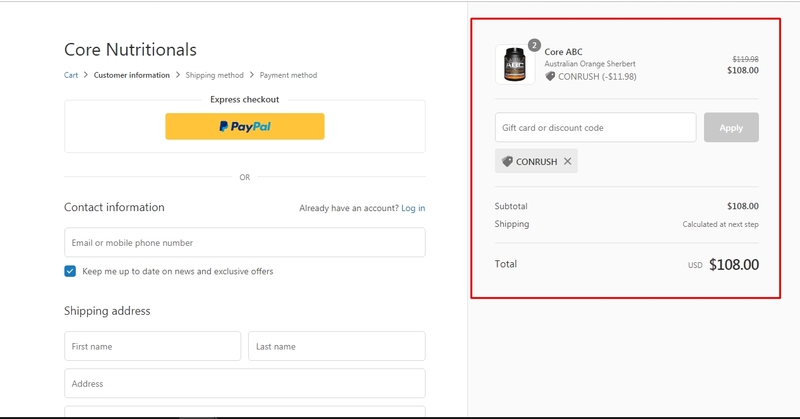 Simply enter code CONRUSH during checkout to take this cool discount. 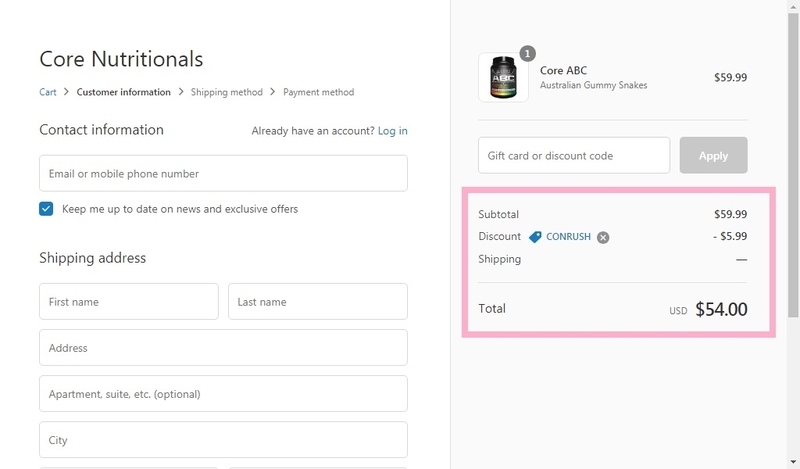 Noe Durán Just enter in the online store, add to the cart any item that you want, apply this promo code during the checkout to get 10% Off Your Entire Order today. Offer ends soon. Exclusions may apply. For more information see screenshot.